This Deluxe Emergency Preparedness Backpack Kit is designed to provide one person with a complete set of emergency supplies for (72 hours) three days. This is FEMA’s (Federal Emergency Management Agency) estimate of how long it can take emergency services to reach you in the event of an emergency. This comprehensive kit exceeds FEMA’s guidelines. 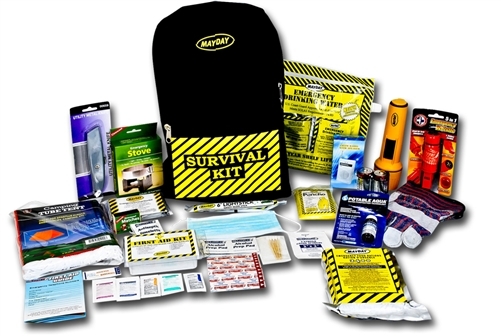 This Deluxe, all-purpose kit is perfect for many emergency situations including: earthquakes, hurricanes, tornadoes, wildfires, floods, mudslides and landslides, blizzards, thunderstorms, blackouts, tsunamis, volcanic eruptions and even extreme heat and cold. This Survival Kit contains a complete set of emergency supplies including emergency food & water rations, flashlight, radio, portable cooking stove, a tube tent, water purification tablets, a first-aid kit and much more. The food & water rations in this Emergency Kit have a5 year shelf life. After 5 years they can easily be replaced with products on our site. Also, should you be stuck in your home, you will be able to use your available water sources with the water purification tablets we’ve included. This is a great Grab & Go Bag that you can store in your home, car or office! This vitamin enriched, great tasting food bar is approved by the U.S. Coast Guard and the Canadian Transport Department. It has a 5-year shelf life with the expiration date clearly visible for easily determinable replacement. The bar consists of 2400 Calories which represents a 3-day emergency food supply for one person. The bar is divided into 6 - 400 calorie segments & requires no preparation. It is safe for vegetarians & those with nut allergies. This ration can be stored in temperatures up to 149 degrees F.
This 4.22oz Emergency Drinking Water Pouch is approved by the U.S. Coast Guard and the Canadian Transport Department. It has a 5-year shelf life. Each pouch is stamped with the expiration date so the replacement time is easily discernable. One of these germicidal tables treats a quart of water. These tables are proven effective against bacteria, Guardia, Lamblia, Cryptosporidium, and viruses. They have no aftertaste and actually improve the taste and odor of water. This bottle treats 50 quarts of water. This Portable Stove is made of durable plated steel and opens into two cooking positions. It folds up into a compact unit for easy storage. The package contains 8 fuel tablets that burn without odor and ignite easily. This two-person tube tent provides protection from the various elements. Setup and take down is quick and easy. This slimline AM/FM Radio comes with a headset and carry strap. As an added convenience, a high efficiency LED flashlight is built into the bottom of the radio. Two ''AAA'' batteries are included. This flashlight produces a super bright light to see in the darkest areas. It’s made of bright yellow plastic which makes it easy to find in low light and comes with a wrist strap which prevents it from being dropped. Two “D” Batteries included! This 6-Inch Glow Stick provides 12 hours of emergency lighting. To activate, simply bend the light stick until it snaps and shake. In emergency situations, a light stick can also make locating someone easier. This disposable 3 ply dust mask with a blue polypropylene spun bound outer layer are Latex free, have low breathing resistance, provide 99.5% plus particular filtration, and provide 97.5% plus bacterial filtration efficiency. This 84" x 52" Survival Blanket retains 90% of your body heat and can be used as ground cover or as a shield from the sun, rain, or snow. This waterproof heavy-duty poncho is made of brightly colored P.V.C. for high visibility and safety. It stores flat and takes up very little storage space. These leather palm gloves help prevent injuries and blisters if an emergency requires lifting debris or moving heavy objects. This 5-in-1 tool functions as a whistle, compass, flint, mirror, and a waterproof container. It comes with a convenient lanyard so it can be conveniently worn around your neck. This multipurpose code is 50’ long and will help in numerous emergency situations. The cord is bright yellow, making it easy to see in low-light or dark conditions. This unique blend of non-toxic chemicals is formulated to light in wet conditions. Match box striking surface is treated with moisture resistant coating. This First-Aid Kit comes with 54 pieces contained inside a locking plastic container. The first-aid kit comes complete with: 1 First Aid Guide, 25 Adhesive Bandages (various sizes), 1 Butterfly Closure Bandage, 5 Cotton Tip Applicators, 2 Sterile Gauze Pads, 1 Burn Ointment, 1 Antibacterial Ointment, 6 Alcohol Prep Pads, 6 Antiseptic Towelettes, 2 Non-Aspirin Tablets, 2 Antacid Tablets, and 2 Aspirin Tablets.